If you’re looking at buying a new Volvo XC90 T8, then it’s probably a high chance that you already know of the qualities of owning a large premium SUV. 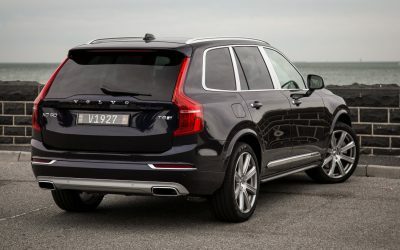 What you might not be quite so aware of is that the new XC90 Hybrid is now available in Australia and boasts a ‘crazy-low’ fuel consumption – particularly when the electric drive is fully functioning in minimal conjunction with the efficient 2.0-litre petrol engine (2.1 litres/100 km). Everyday fuel consumption is more likely around 7-to-8 litres/100 km when the feisty turbo 2.0-litre motor is employed. Still, the T8 fuel consumption is really good for what is a large SUV with heaps of safety kit and plenty of space. From the very first glance, the 2018 XC90 is really nice looking. It’s what you’d call really modern; almost futuristic thanks to the narrow and appropriate ‘Thor Hammer’ signature LED lights. People who will like driving the new XC90 are sure to have great ambition, and if you have a family, there are very few vehicles with as much space, comfort and safety that comes close to a new XC90 – except perhaps the BMW xDrive hybrid SUVs and Audi Q7 e-trons. Driving the new Volvo XC90 T8 gives you the benefit of being able to run with two engine types. Electric motors are ideal for city environments, but what the XC90 provides is a first real alternative to larger V8 and V6 hybrids. Using a smaller 2.0-litre turbo petrol motor definitely ensures that when the combustion engine is being primarily used the fuel economy remains relatively low and stable under all driving conditions. In the city, when the electric motor is the primary motor for propulsion the Volvo can return a fuel consumption figure as low as 2.1 litres/100 km with a range of about 60 km. Get yourself into a situation where you can go totally electric and the busy commute to-and-from work becomes very relaxed – not to mention emission free! Out on the open road, away from the stop/start city life, the 2.0-litre petrol comes into its own with effortless turbo power to keep a natural flow of smooth, refined muscle. Combine the effortless T8 power, smooth eight-speed automatic action and Volvo’s awesome interior comfort and you’ll be in your happy space. Give the 2018 Volvo XC90 T8 the full ‘jandle’ and the 0-100 km/h sprint can be dealt with in around six seconds. A limited top speed of 230 km/h is more than quick enough to see off a few roadsters too while you’re at it! Volvo has kept the AWD XC70 T8 nimble on its feet thanks to the adaptive ability of the modern XC90 suspension. Packing a full 400 Nm of torque, the 2.3 tonne hybrid pulls well and keeps its feet more like a skilled dancer than a heavy sumo wrestler. Inside the cabin the atmosphere is all cool, calm and collected. Volvo has given the big T8 a towing capacity of 2.4 tonnes for a braked trailer. Hitch your boat behind the AWD XC90 platform and the ride remains stable thanks to trailer sway detection. One of the features of the adaptive suspension in the new Volvo XC90 T8 is that, when towing, the vehicle adjusts the horizontal pitch to remain level and controlled. The electric charging system in the Volvo XC90 T8 comes with cables that allows you to connect your big Volvo to the mains in no time at all. When you connect to an industrial socket, it takes less than 2.5 hours to fully charge the battery. But even if you use a domestic socket, the charging process takes around 8 hours. Charging on the move is just as easy – you can fully charge the battery pack at public charging stations in around 2.5 hours or less. And even whilst driving, the battery is partially charged by rejuvenating mechanisms. Large SUV dimensions are redefined in the latest big Volvo SUV. Size matters – especially when you need to carry up to seven passengers, tow a trailer or tackle rough terrain. All of these duties the new Volvo XC90 will perform with ease. Just shy of 5 meters in length, the new XC90 is big; and the 2984 mm wheelbase creates plenty of space inside the new XC90 cabin. Leg room in the front seats is a massive 1038 mm and legroom in the middle row is still a decent 940 mm. Two seats are still available in the third row providing adequate space for an average size adult. 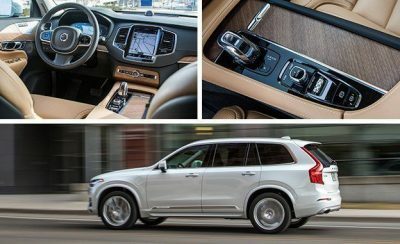 Scandinavian made seats are hugely comfortable, and the new generation Volvo XC90 seats are no exception. The seats have a new slim seat design that incorporates a frame that provides superb ergonomics and comfort. The interior of a new Volvo XC90 T8 is one of premium quality – arguably the best on the market with beautiful materials, attractive design and excellent workmanship. 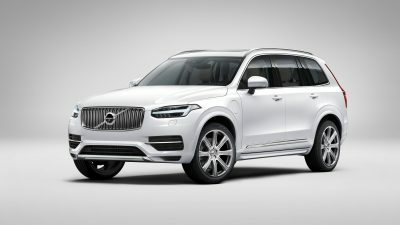 Whichever model of XC90 T8 you drive, you will be offered wonderful technology, and it’s things like the intelligent info-entertainment systems, 19-speaker surround sound audio, heated seats, a centre dash touch screen, GPS mapping, suspension settings for (Comfort, Dynamic, Eco, and Off-road), Crisp LED headlights and clean-zone air technology which makes travelling in the big Volvo SUV such a pleasure. You are truly in an exclusive league when driving any new Volvo XC90, yet the T8 adds even more prestige with its hybrid technology. Safety features are in abundance. Crash test worthiness of a new Volvo SUV is first class. It is the class leader. One of the major weapons the Cc90 has in an accident is the strength of the safety cell. In the event of a serious collision with another vehicle of the same size or an immovable large object, the XC90 has force reduction channels by which the energy of the impact is absorbed and channelled away from its occupants. Interior airbags are situated at the front, side and rear of the vehicle. Specially designed ISOFIX child seat anchorages and top tether points are supplied for smaller people, while pre-tensioning seatbelts and neck protection systems are all part of the premium Volvo safety systems. Other features which help in avoiding a big collision are top-shelf ABS brakes, electronic brake-force distribution, electronic differential lock, traction control, electronic stabilisation control, adaptive cruise control with traffic jam assist, Active Lane Assist, a Collision Avoidance System, high beam assist, park distance control, a 360 parking camera and automatic park assist. Out on the road, the new Volvo flagship SUV feels very safe and secure. Quiet cabin ambience and large interior space makes for one of the best interiors for high comfort levels for any length of journey. Power delivery is instant and smooth, and there is loads of torque available for crisp performance even when fully laden with gear and occupants. For any more information on the new 2018 Volvo XC90 models or, for that matter, any other new car, contact one of our friendly consultants on 1300 303 181. If you’d like some fleet discount pricing (yes even for private buyers! ), we can submit vehicle quote requests out to our national network of Volvo dealers and come back with pricing within 24 hours. Private Fleet – car buying made easy!